The last time I ate Hummus at a restaurant I decided that the time has come to make my own. It’s one of my favourites from the Middle Eastern cuisine and you can be sure that I always order my own little bowl of this delicious spread when we go to a restaurant to make sure that I definitely have enough for myself. I’m an expert when it comes to eating it but not preparing it and I didn’t want to make a fool of myself so I decided to ask two experts, both very good friends of mine from Israel. They recommended using really good quality Tahini from Lebanon because this sesame paste has a big influence on the Hummus’ taste. 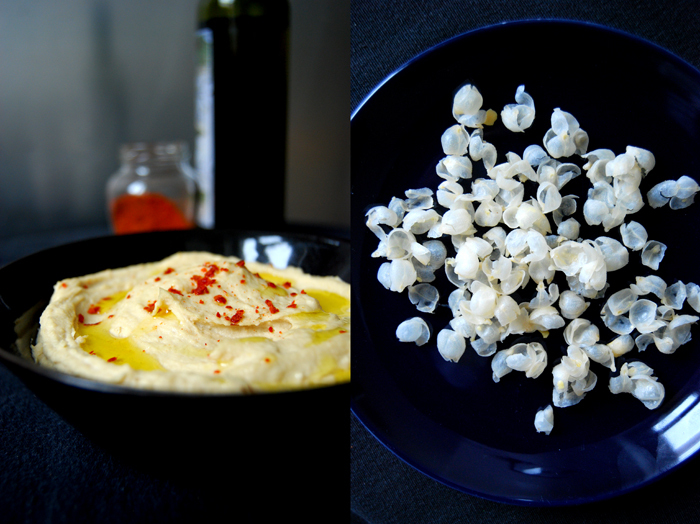 It’s one of the main ingredients together with cooked chickpeas and this is actually where Hummus gets its name from, meaning chickpeas in Arabic. It’s very easy to prepare if you use tinned chickpeas – that’s what I did and the expert opinions didn’t object – you just have to peel them which only takes 5 minutes. It’s more like popping them out of their peel between two fingers, it’s fun! 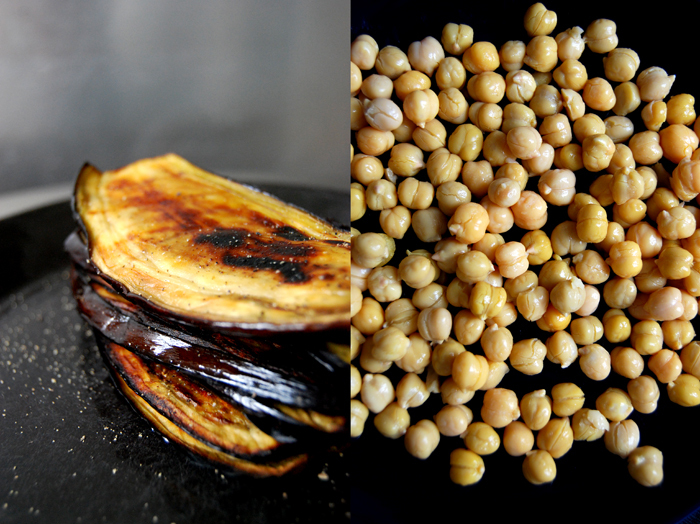 Then you add the Tahini, fresh lemon juice, garlic, salt, water, mix everything in a blender and your Hummus is done. My friends also told me about a sandwich which is very popular in Israel – Sabih (meaning the handsome one!). 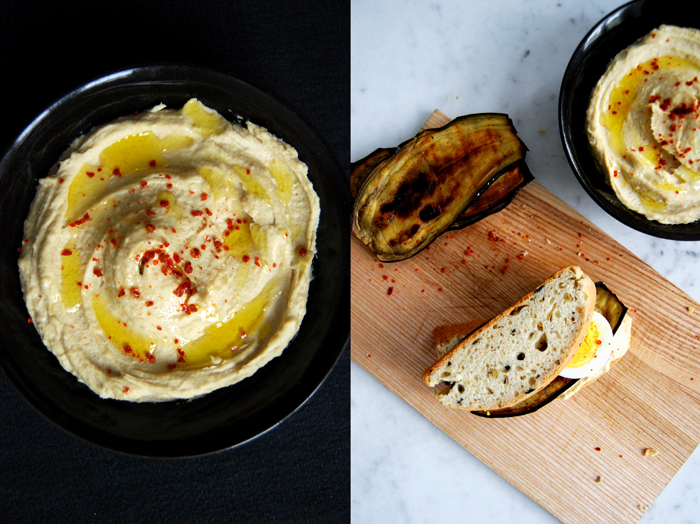 You spread Hummus on some good white bread (I use my olive bread which fits really well with its juicy texture and flavours of green and black olives), then you put slices of grilled aubergine and boiled egg on the Hummus and sprinkle some Harissa on top. This is too good! I’m not normally the first one to put an egg on a sandwich, but here I make an exception. 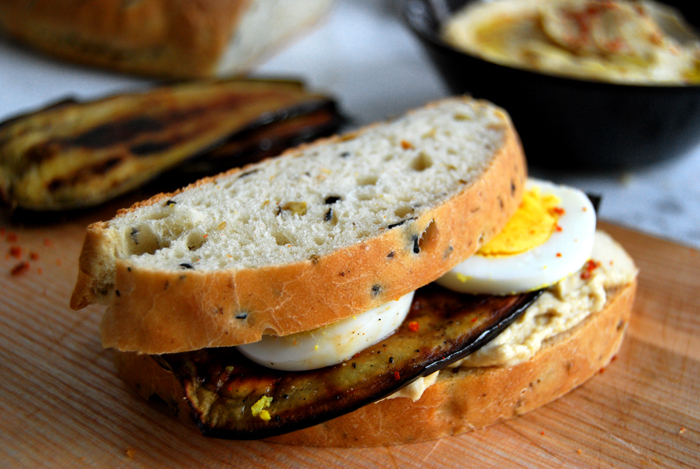 The creamy Hummus, the juicy bread, the aubergine, the egg, the whole combination is just divine, I’m not surprised this sandwich is so popular! I made enough Hummus to fill a large bowl as you can keep it in the fridge for a few days. For the sandwich you can also use white flatbread but I must say that I really enjoyed it with my thick and juicy olive bread. Purée all the ingredients in a blender until you have a smooth paste, you can add a little more water and lemon juice if you want the Hummus less thick. 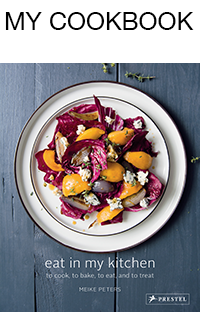 Fill in a bowl and sprinkle with olive oil and Harissa. Brush the aubergine slices with olive oil, season with salt and pepper and grill in the oven until golden brown and soft. Spread the Hummus on a slice of bread, put 1-2 slices of the grilled aubergine and some of the egg on top and sprinkle with a little Harissa to add more spiciness. Close with a second slice of bread to finish your sandwich.